I've been to Rim Nam on two occasions during NordicFuzzCon and enjoyed the visits greatly. 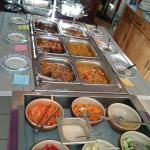 The buffet on offer was of great value, and the food was always fresh and inviting, and everything was good. The owners are a lovely and welcoming couple with a lot of charm and personality. The decor is your standard Asian restaurant interior and is cozy enough, nothing special. I never got around to try the a'la carte, but the meny is sizeable and should have something for everybody. Now that the convention is moving to a new venue I think this place is one of the things I'll miss the most. The lady who runs is an energetic and effective lady who seemed genuinely happy to see us and would smile and wave if we walked past. So in short, good food, great service. Well worth a visit if you're in the area. Been to Rim Nam Thai Food? Share your experiences!